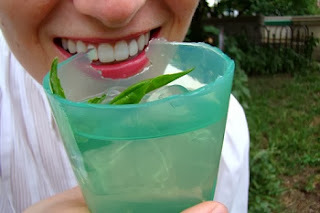 Viv Biz Club Blog: Evolution of Disposable Cups: From Plastic to Compostable to Edible? 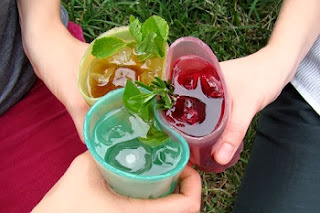 Evolution of Disposable Cups: From Plastic to Compostable to Edible? Meet Jelloware – an edible concept cup made entirely out of agar agar(a vegan gelatin derived from red algae that’s often used in Asian deserts). The cups are designed by The Way We See The World, a New York based design consultancy. They’re available in various flavors to compliment your drink, including: lemon-basil, ginger-mint, or rosemary-beet. They are disposable and are meant to be thrown in the grass to biodegrade after you’re finished (and as TWWSTW points out, agar agar actually nourishes the growth of plants). Now over the course of running the Viv Biz Club we’ve had quite a few folks ask us what happens if they accidentally take a bite out of a corn cup made from PLA. The short answer is: “well, we don’t recommended eating PLA products, but you should be fine”. PLA is non-toxic and a small piece will simply pass right through your gastrointestinal tract. That being said, if you have been looking for an edible cup, well look no further.